Villa Fioruccio consists of two independent apartments with separate entrances. On the ground floor is a porch at the entrance of about 40 square meters. The first floor is accessed via an outside staircase and a large terrace with table and chairs. The large garden of about 4000 meters is fenced and there is an automatic gate. The lovely swimming pool is surrounded by a teak wood. The panorama of the house is really impressive. You can enjoy the green Sibillini mountains and the blue Adriatic Sea. 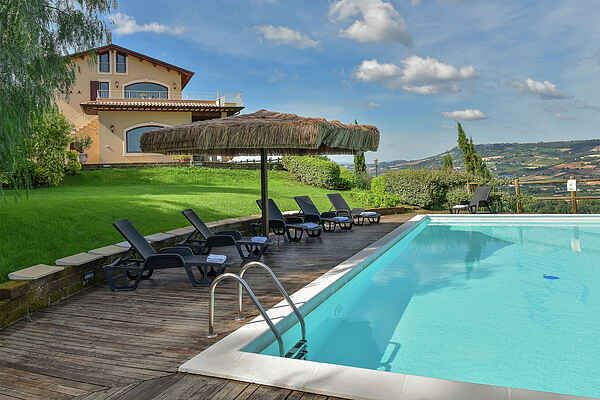 It is the ideal location to spend with your family or friends a quiet holiday and trips to the sea and surrounded by soothing natural countryside of the Marche. In the small outbuilding is a laundry room with washing machine. The sofa bed can accommodate 2 small children.